Looking down onto the main shopping centre in Tavistock. I wasn't sure what to share with you today so I compiled a list of blog ideas. On that list was the rather vague idea of 'funny stories'. Trying to keep with the craft theme, I thought I would share with you some of my funny Yarn Shop Stories. 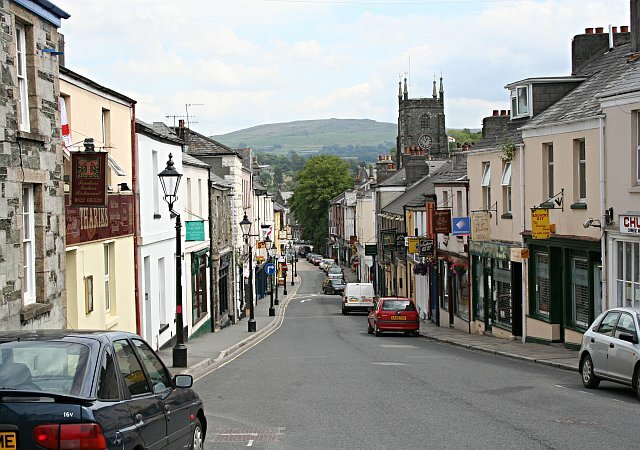 One afternoon I was shopping in Tavistock when it began to pore down with rain. To escape the deluge, I sought cover in my local yarn shop, Soft Touch Needlecrafts. I ran in, shook my rather long, tangled hair, spraying the room with rain water. I waddled through the sewing section of the store, and into my favourite part, the yarn room. Or heaven, as I like to call it. I'd managed to hide myself in a rather cramped corner, and was sifting through the mountain of Baby DK they have on offer, when a young girl (about my age, 18+) and her grandmother wafted in. I popped my head round an enormous skein of Aran yarn and watched the following enfold. The Grandmother charged towards a basket of Rico Design Pompon yarn (a basket I myself keep well away from), she picked up a ball for each hand and as she was inspecting them said to her granddaughter: "What do you think of these? I could make you a scarf with them?!" The Grandmother dropped the balls of yarn (not really caring if they fell on the floor or not, fortunately she has a very good aim and they landed perfectly in the basket) and scurried over to a basket full of eyelash yarn. Pointing to the basket as she said: "Now, what do you think of this. I could knit you one of those fashionable scarves with this stuff! What colour would you like?!" "I'm ok, thank you Grandma" the young girl sighed. Now, I swear to you, that the Grandmother went around the shop in this fashion for ten minutes. I couldn't help smiling every time I heard "OOOOH! What about this one dear?! I'm sure you'd like this!" from across the store as I carried on perusing the yarns on offer. I thought it was very sweet yet amusing how desperate she was to knit her granddaughter a scarf. I will try to stop by and peek again - Happy Blogtoberfest!